The iPhone 3G is already treated like a bar of gold or something akin by a substantial amount of its users. But what if it really was worth thousands and thousands of pounds? You’d never want it to leave the house through fear of irreparable damage (unless you had a disposable income). 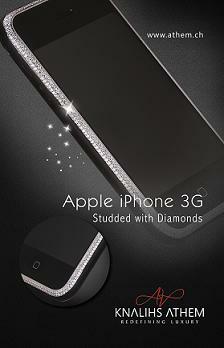 Hopefully the potential customers of Knalihs Athem’s diamond encrusted iPhone 3G won’t think that way. The luxurious jewellers has once again added some unnecessary bling – 475 diamonds worth to be precise – to yet another luxury handset, upping its value to an amount that’s not even worth mentioning because you won’t be able to afford it! Ok, you asked for it, but don’t come a’ crying when you see the diamond encrusted price tag – $10,000 USD – and that’s only the first ten handsets. The remaining 40 will come with a considerably higher price tag. It’s limited edition as is most of their bedazzled handsets, so that means only 50 are available worldwide. it looks great- although not really practical idea for a device that tends to be used on the go surely you would end up a few diamonds short and someone else a diamond richer- finders keepers -after a couple of months use…plus i think theres some fab designs out there from independent sources that are less wide known. from gold plating to bling covers to customised funky skins that all have great affect too-but the diamond encrusted phone defo has an unbeatable wow factor! it’s kind of unnecessary…and a bit excessive. but regardless, i’m drooling.